3M™ Roloc™ Disc 777F features 3M-engineered high-performing ceramic abrasive grain blended with aluminum oxide for a combination of durability and cutting efficiency that increases productivity for both stock removal and finishing. The heavy, water-resistant polyester backing supports medium-pressure applications, a consistent cut-rate, and both wet and dry applications. Our 3M™ Roloc™ Disc 777F is resin-bonded to withstand high heat and pressure. A grinding aid on the 777F disc reduces grinding temperatures to protect heat-sensitive alloys such as stainless steel and nickel alloys. 3M™ Ceramic Abrasive Grain is a ceramic mineral designed to enhance toughness and hardness of the grain. For increased performance, 3M™ Roloc™ Disc 777F products feature aluminum oxide mineral blended with 3M™ Ceramic Abrasive Grain which is one of the hardest, longest-lasting minerals available. Perfect for moderate to heavy stock removal, ceramic abrasives are engineered to cut fast and handle intense heat and stress applications. 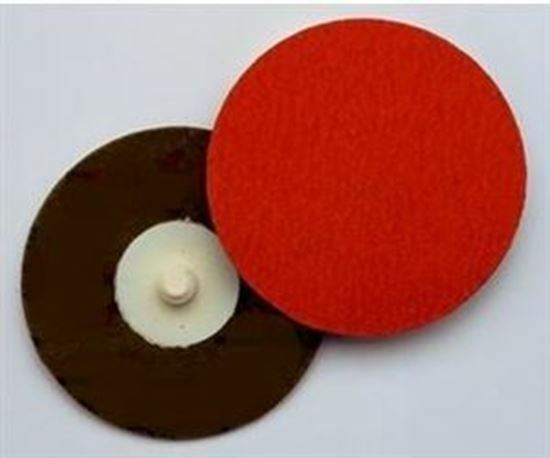 Ceramic aluminum oxide blends surpass aluminum oxide abrasives in cut-rate and durability making them an excellent choice for difficult grinding applications. 3M™ Roloc™ Disc 777F is available for use with the following Roloc attachment systems: TSM, TR, TP and TS. Please select discs with the attachment design made for your system.